Well, here we are, the end of the season. This one in particular seems to have flown by and unfortunately I a have to admit I've found myself a bit bored this season, I just haven't felt fully entertained, only at certain points, here's hoping next season we can improve on that! Sunday of course may be the last game of the season but with Liverpool destined to finish in 7th place win, lose or draw all of the focus is on the retiring James Lee Duncan Carragher. 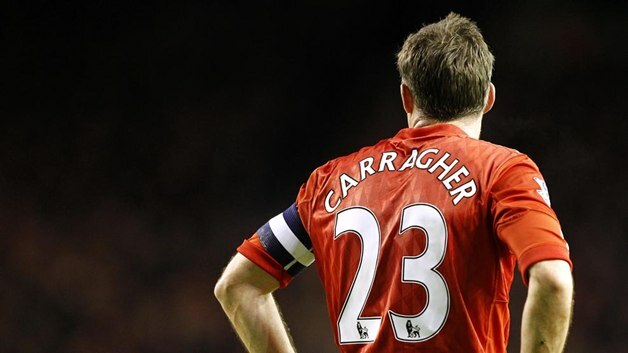 I've always loved Carragher, from schoolgirl crush to adult crush to having a general soft spot for traditional old fashioned defenders, I just feel that he's a credit to not only his sport but to sportsmanship and to gentlemen as a whole. Liverpool came back from a goal behind at Craven Cottage on Sunday to win the game 3-1 courtesy of a Daniel Sturridge hat trick. Berbatov opened the scoring for the home side but the Reds quickly found an equaliser and went from strength to strength. Fulham were angry that they weren't awarded a penalty after the ball struck Lucas' hand in the second half and this perhaps stumped their momentum. Liverpool began the game with a pretty different starting XI. Steven Gerrard was the main man missing but there was also no Agger or Skrtel giving Coates a chance to start. Wisdom and Shelvey also made appearances. Liverpool began the game strongly applying pressure on the Fulham back four. One member who would appear as a substitute received a great reception from the travelling fans, John Arne Riise made clear his appreciation after the match. Liverpool failed to collect all 3 points at Anfield on Sunday as they struggled to find the back of the net in a rather uneventful Merseyside derby. We're quite used to seeing an exciting 90 minutes when this fixture comes around but not this time. The most controversial moment of the game was a disallowed goal from Distin. A lovely gesture from Liverpool at the start of the game saw The Kop end create a mosaic saying "Thanks" to Everton. Liverpool's Luis Suarez had to settle for watching from the stands with his wife and daughter whilst Daniel Sturridge lead the line. Coutinho was again chosen to start and Borini was on the bench once again. The first half on Sunday was barely anything to write home about (or blog about) surprisingly there was no real sense of urgency in a game that usually sees the excitement get the better of most players. Steven Gerrard, Coutinho and Sturridge were perhaps the most lively however. Sunday marks the day for the 220th Merseyside Derby. It's quite hard to believe there's been so many clashes between the red and blue side of Liverpool but any fan will tell you that this game means the world, it means even more when you realise Liverpool could close the gap on Everton with 2 league games left to go this season. Liverpool are in a decent position injury wise with no new real worries. Suarez is obviously still unavailable but Fabio Borini who scored in the last fixture is expected to be on the bench again for this one. Everton are also in a relatively strong position although Phil Neville will miss out due to a knee injury.